Your fifth graders will love Kipling’s Just So Stories! (And you’ll love how differentiation and scaffolding make this set of lessons accessible to all students.) 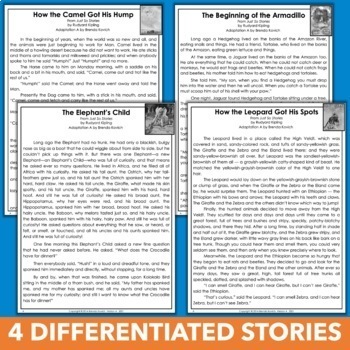 Four stories are differentiated at three reading levels, and student sheets come with or without scaffolding. 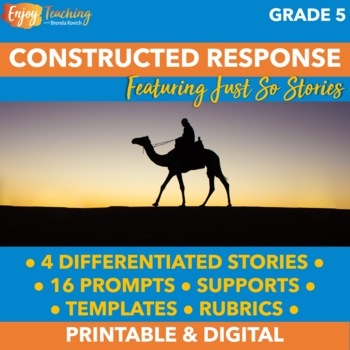 Emphasis is placed on constructing complete responses with a topic sentence, supportive evidence from the text, quoting, citing, and a conclusion. 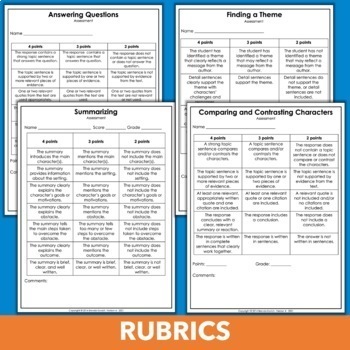 You can focus on one standard or practice all four: RL.5.1 Answering Questions, RL.5.2 Summarizing, RL.5.2 Finding a Theme, RL.5.3 Comparing and Contrasting Characters. Differentiation is built in, so you teach one lesson to the entire class. Advanced readers read Adaptation A of the story and complete the student response sheet without scaffolding. On-level readers read Adaptation B and complete either the response sheet with or without scaffolding. Low readers read Adaptation C and complete the response sheet with scaffolding. After reading Kipling’s Just So Stories, why not write some pourquoi tales? Check out Just So Writing. Kids will love writing “How the __________ Got Its __________”! Just So Stories, written by Rudyard Kipling, was published in 1902 and is now in the public domain.